Avid Star Wars fan Cathy Kendrick has devised an interesting way for fans to make new friends, get involved in an interactive game and help to maintain the biggest, privately-funded Star Wars collection on the planet - the famous Rancho Obi-Wan, which is run by the equally famous Steve Sansweet. Cathy's project is a play on that infamous Facebook letter tile game (that was a play on a more famous letter tile board game) but with a Star Wars twist! 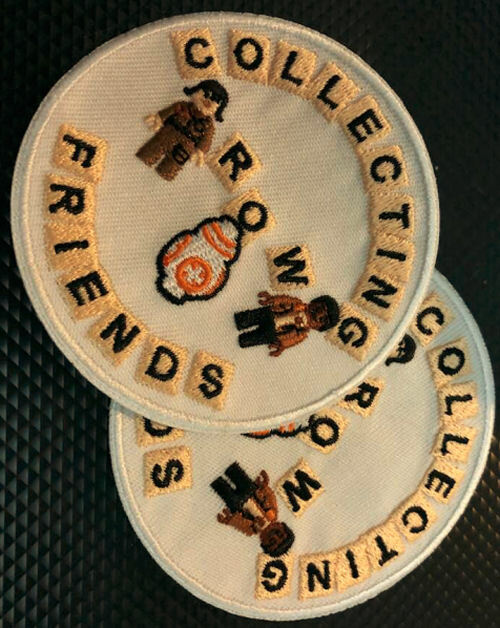 The goal of the game is to create Star Wars related words or phrases using special letter tile pins. By creating words - like WOOKIEE or VADER - you can earn points, and points can be turned in for prizes (while they last). And just like in Scrabble, each letter has a point value and the bigger the overall point value of the word or phrase you make, the bigger the prize you might win! The game is limited to 350 players so don't delay in joining up - just visit the game's Facebook page and make a donation to Rancho Obi-Wan and your name will be added to the official roll.